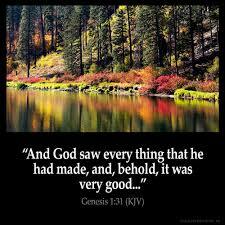 This week we will be looking at the Creation account as found in Genesis 1. On the same day God created Adam and Eve, He instituted marriage. Then He rested on the seventh day and this special Sabbath day was declared holy. How does our culture view marriage and Sabbath rest? Perhaps it’s time to return to God’s standards and align ourselves with all the things He declared to be good. He is good….good….oh…..